Why the Acoustics of the Stethoscopes ERKA are so Brilliant? Our unique patented ERKA dual diaphragm enhances the acoustics of the ERKA stethoscopes CARDIOLOGY significantly, thus ensuring an unmatched sound precision. The point of reference for the physicians. Why Does ERKA Use a Dual Tube? The ERKA dual-channel tubes have two internal channels to reach each ear separately. This maximizes the quality of sound transmission and minimizes external noise. You’d Like to Concentrate on the Essential? The ergonomically shaped super soft ear tips will fit your ear canals perfectly and block out external noise. What Makes an ERKA Stethoscope so Individual? Every single ERKA stethoscope is a unique masterpiece: elaborately polished and chrome plated by a master craftsman since 1889! Handmade in Germany with the experience of more than 125 years. How Can I Personalize My Stethoscope? Each stethoscope can be personalized with an individual laser engraving or a customized membrane. What Distinguishes the ERKA Stethoscopes from the Broad Mass? Be special! Choose from a wide range of different tube colors to render your everyday life a little more colorful. How Can ERKA Protect You and Your Patients Against Infections by Using a Stethoscope? All components used in an ERKA stethoscope can be cleaned and disinfected easily and thoroughly. We continuously test all common medical detergents and recommend these disinfectants unrestrictedly. What Does Your Patient Can Expect of an ERKA Stethoscope? Our membrane has been successfully tested and accordingly certified for biocompatibility. It also was classified as dermatologically safe. How ERKA Protects You Beyond? 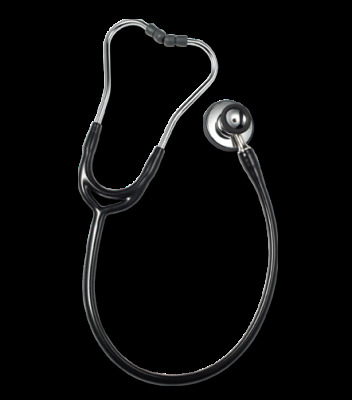 The chest-piece of an ERKA stethoscope is made from hand polished and pore free chromed brass. Compared to aluminum or stainless steel, this surface is more resistant to germs and bacteria. Why an ERKA Stethoscope is Suitable for Perfect Auscultation? Each ERKA stethoscope is equipped with a perfect ergonomically shaped chest-piece available in different sizes.This enables auscultation even in hard-to reach areas or for different constituted patients. Yes! Therefore the ergonomically shaped binurals of every ERKA stethoscope are individually adaptable to your ear canal - so you can work perfectly. Every ERKA stethoscope comes with an extra selection of ear tips to best meet your needs. Membrane: The construction of the patented ERKA. dual-membrane allows for an additional resonance chamber which optimizes the sound. Chest-Piece: Highly polished and chromium-plated for a non-porous surface, the brass chest-piece ensures perfect surface hygiene. The reversible double chest-piece has an open bell side for the low frequencies and a membrane side for the entire frequency spectrum. Spring & Tube: Two internal channels run parallel in the stethoscope tubing. This prevents the friction noises caused by two separate tubes. Through the separately integrated spring in the tube, there is no acoustic loss from the chest-piece to the ear. Binurals: The standard 15° inclined binurals can be individually adapted to the ear canal characteristics of the user. Ear Tips: The ergonomically designed, super soft ear tips create an excellent acoustic seal against external noise interference and maximize wearer comfort and fit.